Offering a proprietary, state-of-the-art technique that allows DNA to be retrieved from persons both living and deceased without the need for drawing blood, with unique technology that allows families to keep a loved one's DNA safely stabilized for storage at home at room temperature in a specialized capsule, thereby removing the need to pay for specialized storage services, Eckels is pleased to offer DNA Memorial's advanced services to our valued clients. Why preserve a loved one's DNA? Why have your own DNA and that of other living relatives preserved and tested alongside that of a deceased loved one? In essence, there are two main uses for DNA: obtaining information on ancestry and medical insights. • Ancestral testing and recording allows you to search for genetic ancestors and learn new insights into the origins of your family and its ancestors through DNA testing, which can be dated back hundreds of years. For those into the study their genealogy/family history, DNA can reveal many insights that traditional records cannot. • Medical testing of DNA plays an important role in predicting hereditary diseases and in offering "personalized" or "precision" medicine. Doctors can use data obtained via DNA testing to assess the probability of the risk of certain genetic diseases, as well as aiding in the prediction/early detection of the treatment of cancers. Many cancers can now be linked to DNA to determine if someone has a relatively high or low risk factor of developing cancer in their lifetime. Hereditary disease prediction is possible through building your family’s Generational DNA Library. Doctors and scientists are able to analyze DNA gene mutations from one generation to the next. This results in the capability to predict not only if a family member will be diagnosed with a hereditary disease, but approximately when the hereditary condition will be triggered. When you are aware of what diseases you are at higher risk of developing in your lifetime, that information can aid in the early identification and treatment of those diseases. Offering DNA testing to the families is not simply about memorialization; what we are talking about is offering saving lives. The medical benefits of DNA testing are the real priority to us t a minimum, DNA is capable of minimizing and optimizing invasive treatment plans (chemotherapy, surgery). Ideally, every family member will have their own DNA vial securing a powerful spot in the Family Biological Tree. 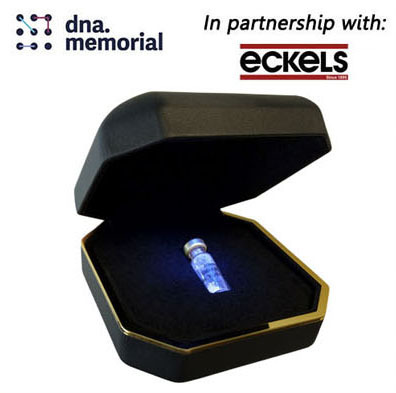 At Eckels, we would be happy to arrange for an in-person meeting or a web conference to discuss the benefits of adding DNA Memorial to your regular offerings to the families in your care. Please contact us at 1.800.265.8350 or info@eckelsandcompany.com for details.